The refined, compact design of TriAuto mini’s head and body is very small and lightweight. With this handpiece, the dentist can experience the same tactile feedback as manual filing while various automatic controls reduce the risk of file jamming and breakage. Its slim design allows for easy access to posterior teeth with the ability to view both the canal openings and the pulpal floor during instrumentation. Another new and convenient feature is coordinated color change on the LCD display so that the dentist can easily recognize changes in speed, torque, file tip location, display type, etc. 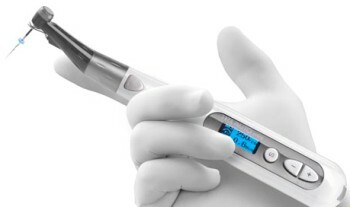 When connected to the Root ZX mini, the position of the file tip is monitored during the procedure, and many automatic functions such as Auto Apical Reverse can be activated.